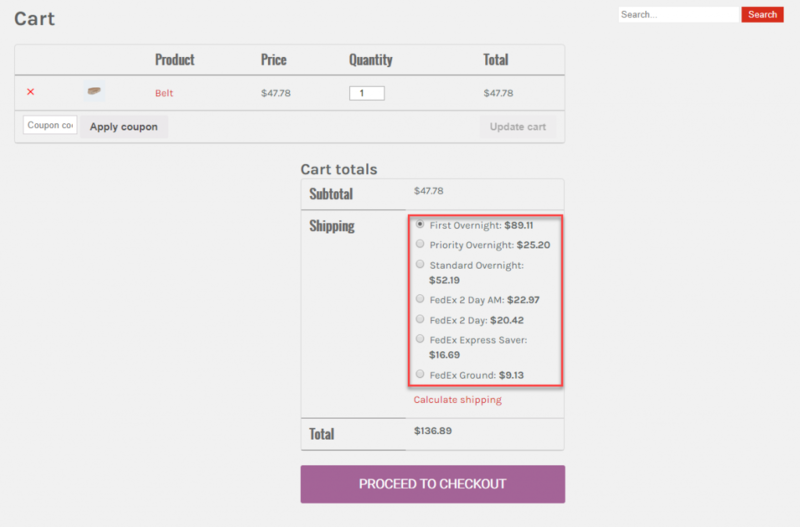 Home / How to Display FedEx Shipping Rates on your WooCommerce Store during Checkout? As a WooCommerce store owner, you know the importance of displaying live rates of popular carriers. It helps to improve customer satisfaction, as you bring in transparency in shipping charges. 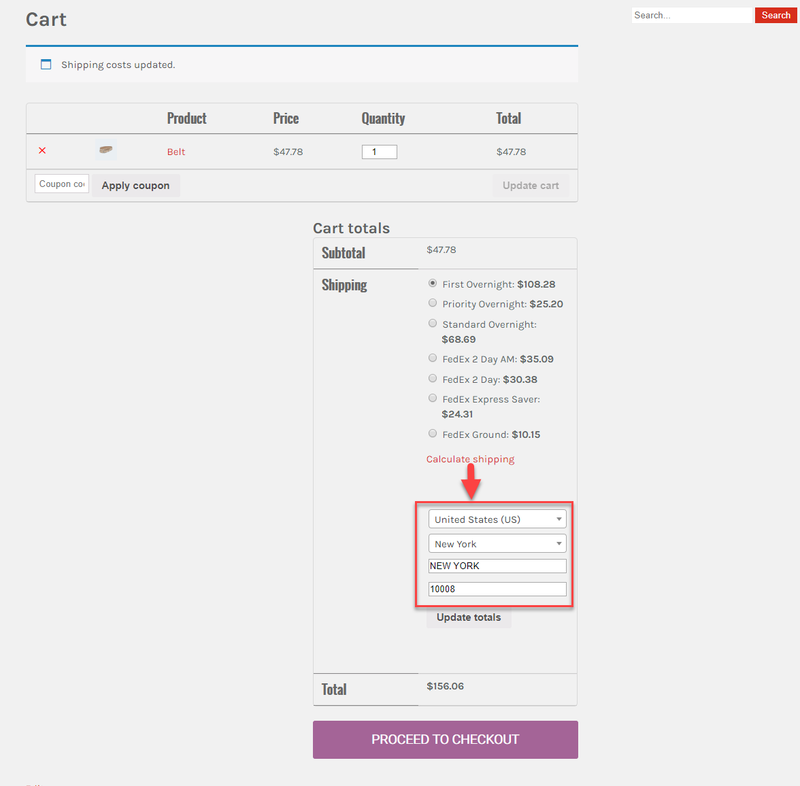 Moreover, displaying additional shipping charges while checkout is one of the major reasons for cart abandonment, which you can avoid. 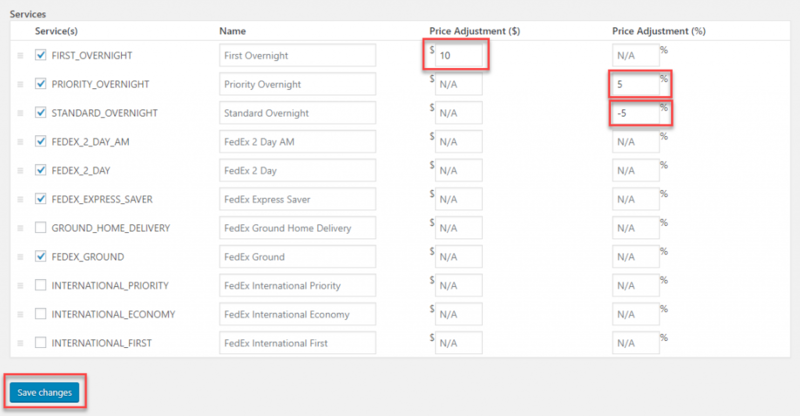 In this article, we will describe how you can display FedEx shipping rates on your WooCommerce store during checkout. 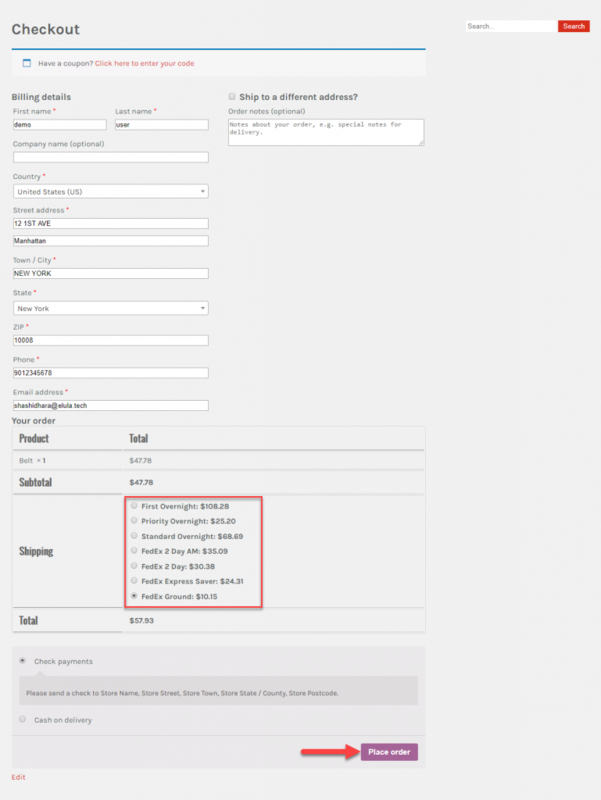 How to display FedEx shipping rates on your WooCommerce store? Let’s look into a scenario. A customer adds a product to Cart. Before checkout, the customer is able to select a suitable FedEx shipping service from the available options. Please see the screenshot below. 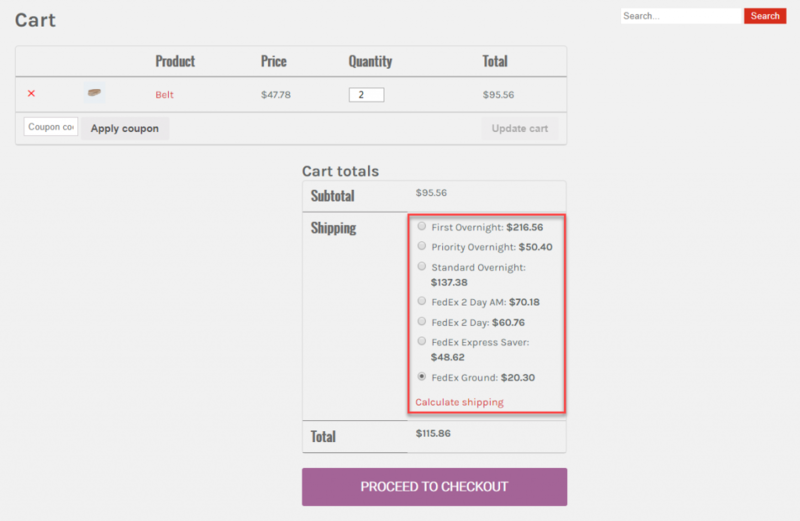 The customer will be able to see the same rates on the Checkout page as well. The Flat Rate fields are not applicable to FedEx, hence we will leave them blank in this example. Also, on the Rates Type field, you can choose whether to display Commercial or Residential rates. 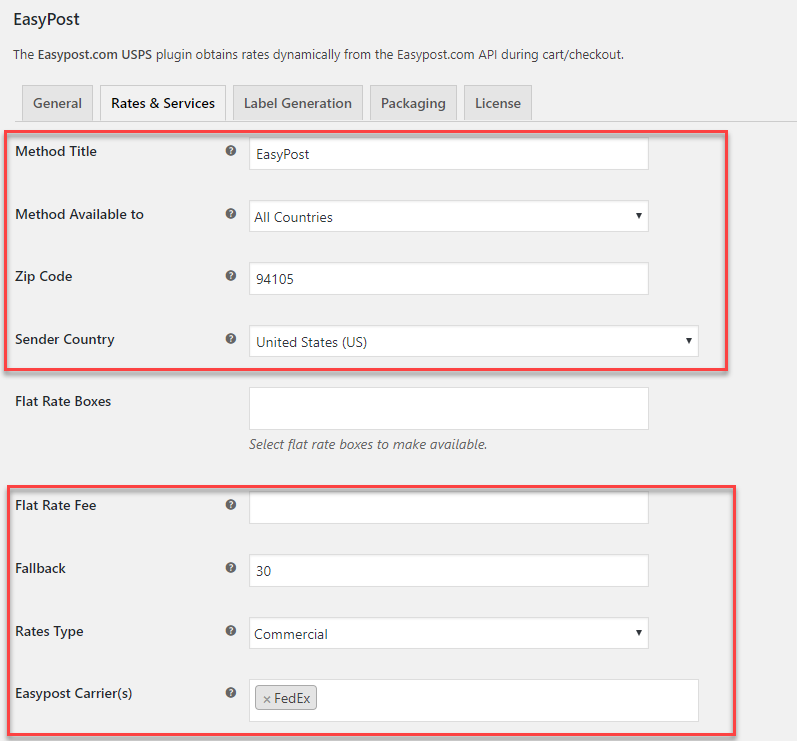 As the EasyPost API supports multiple shipping carriers, you can choose the carriers you want to display here. For this example, we will choose only FedEx. Please note: If you have any flat rate or free shipping conditions already configured on your site, those will be displayed along with the FedEx rate. Here we have disabled all the other shipping methods. On the Services section, you can select specific FedEx services you want to display on the Cart and Checkout pages. Here, you will be also able to make price adjustments to each service. This can be done by specifying an amount or percentage. You can specify either a positive or negative amount depending on the requirement. 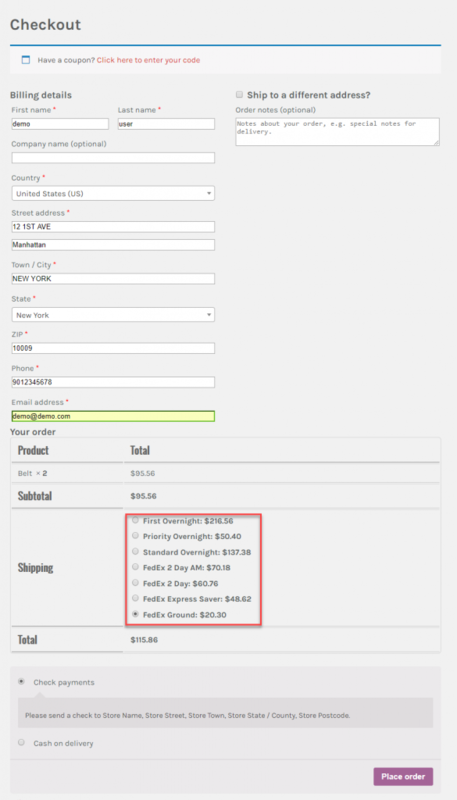 Now, when customers add products to Cart from your site’s frontend, they will be able to see the live FedEx rates based on the destination address and choose the suitable shipping option. If they want to check the rates for a particular zip code, they can simply click Calculate shipping option below the rates. Here they can update the zip code and check for difference in rates between two shipping location. Customers can choose any of the available FedEx services and place an order on your store. Once an order is placed choosing one of the FedEx services, you can provide shipping through that specific service. You will be able to automate the entire fulfillment process through FedEx right from your WooCommerce admin. Find more details on these features here. The rates will vary also based on the box packing algorithm that you choose. You can find out more details on box packing settings here.